Armenia’s aggressive policy and occupation of Nagorno-Karabakh and seven surrounding regions have cost $ 177 billion worth damage to historical and cultural monuments of Azerbaijan, as well as $ 55.4 billion worth damage to public properties of Azerbaijanis. Ibrahimov said the amount of damages caused as a result of looting and destruction of Azerbaijan’s natural resources by Armenians have exceeded $190 billion so far. He noted that the amount of the damages resulting from continued aggression of Armenia is growing each year. 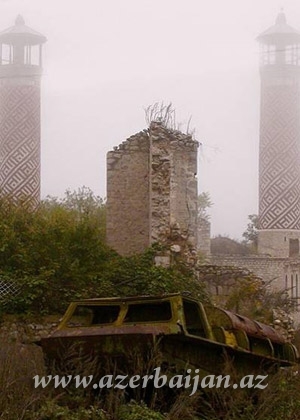 Armenia captured 20 percent of Azerbaijan's internationally recognized territory, including Nagorno-Karabakh following a lengthy war that ended with the signing of a precarious cease-fire in 1994. Since then, Armenian armed forces continue invasion Azerbaijani territories defying international calls and UN Security Council’s four resolutions on the conflict. After invading Azerbaijan's territories, Armenia has been pursuing the campaign of ruining cultural and historical monuments of Azerbaijan. The first human dwellings like the well-known Azykh and Taghlar caves, the Garakopak and Uzarliktapa burial mounds, located in the occupied territories, are now being used for military purposes. Most of them have been destroyed. Cemeteries, mausoleums, monuments, mosques, temples and monuments that once belonged to Caucasus Albania and other cultural heritage sites in the occupied regions of Shusha, Lachin, Kalbajar, Gubadli, Zangilan, and Fuzuli have been destroyed along with burial mounds in Khojaly, Aghdam, Aghdara, Fuzuli and Jabrayil. The Armenians are fabricating facts about the monuments of the ancient Caucasus Albania. A variety of ancient Albanian scripts, wall designs and crosses have been replaced by Armenian attributes. A number of mosques are being used as store-houses. Buildings as well as unique exhibits of the museums located in the occupied Azerbaijani lands have been either destroyed or used as a basis for new museums, with Armenians claiming that they belong to them. The destruction of Azerbaijani cultural monuments in the occupied territories continues and the invaders are carrying out large-scale archeological excavations, destroying burial mounds. Preservation of historical and cultural monuments in the Armenia-occupied territory of Azerbaijan as memories of the nation's centuries-old history is a matter of international importance, because Azerbaijani people's cultural heritage is an integral part of the world culture. The destruction of the historical and cultural monuments by the Armenian invaders in the occupied territories of Azerbaijan contradict the 1954 Hague convention on preservation of cultural values during armed conflicts, the 1992 European convention on preservation of archeological heritage, and the 1972 UNESCO convention on preservation of world cultural and natural heritage.